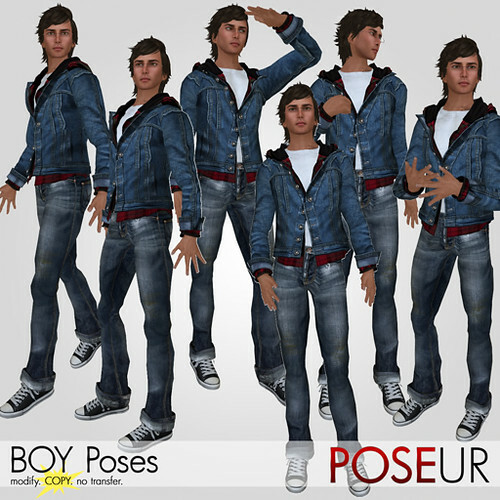 POSEUR; lots of new poses! POSEUR has a LOT of newness out, including five great items for charity! This is a versatile little staple that photographers and models will want in their collection of pose props. If you love taking snapshots of yourself in different locales or if you simply love photographing that latest cute outfit you put together), then you’ll want the Ganguro poses! The next five items are currently available only at the Project Donate sim, with proceeds going to UNICEF to help provide relief for people affected by the Pakistan flooding. Although we <3 girls very much, POSEUR is also about the boys! Introducing our first posepack that is meant specifically for men. 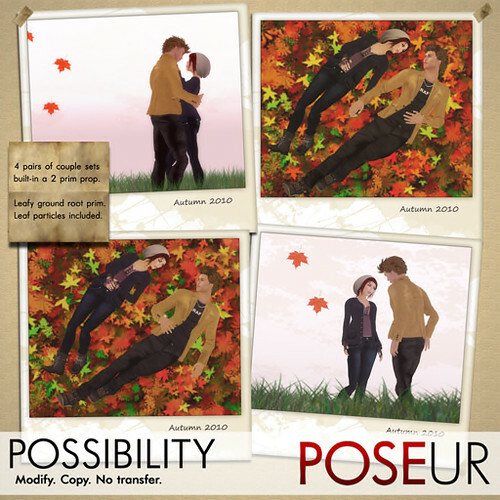 This is a pose prop for couples, and is right on schedule for the fall season. 🙂 It’s equipped sweet little falling leaf particles, and you can even choose to lay on a bed of leaves with your loved one.